If you haven't made your Valentine's Day dinner reservations by now, don't bother. It's not worth it because: 1. there aren't any tables left at your favorite restaurant at this late date, and 2. why spend money on a romantic night out when you can have an even more romantic night in? 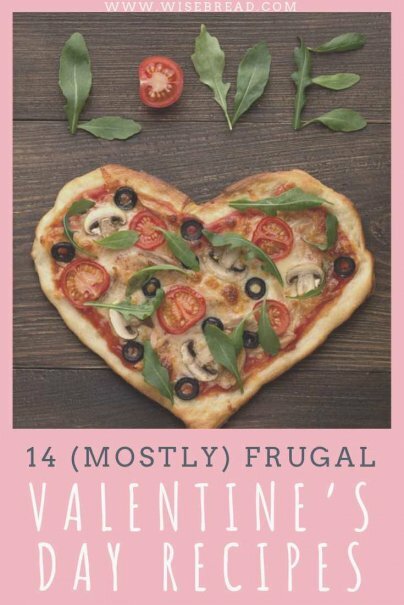 Papa John's usually sells heart-shaped pizzas around Valentine's Day — and I'm sure there are other pie makers who do the same thing — but you don't have to order in when you've got this homemade recipe for Valentine pizza. The dough calls for fresh rosemary, which is a nice touch, and once it's made you shape three equal half-inch-thick portions into a heart shape. When the dough is ready, spread on the sauce sauce, sprinkle on the cheese, and add your favorite toppings. This recipe strangely calls for sliced zucchini — and that's fine if that's your thing — but I'm sticking with "normal" ingredients like pepperoni and fresh basil. There's no cut of steak that says "I Love You" quite like filet mignon, and this recipe for pepper-crusted filet mignon is way easy. Pick up two five- to six-ounce filets (about one-and-a-half inches thick) — or to save money, use small appetizer-sized filets that you can find at a Target with a fresh meats section. Season them with olive oil and coarse salt (like Kosher) and coarsely ground pepper; pat both seasonings into the steaks. Cook the filets on a small skillet over medium-high heat for three to five minutes per side for medium-rare. The recipe also includes a rich red wine sauce that's made with one cup of red wine, two tablespoons of cold butter, and coarse salt. Pair the meal with your favorite sides; I'd go for a baked potato and roasted green beans (but call the latter "haricot verts" at the table so you can up the ante on the fancy). You'll save money by not buying more than you need (if you don't need a whole pound, don't buy it). If you buy the item frozen instead of fresh, the price per pound is usually lower by a few dollars. Looking to impress your dinner date? Show up to the table with lobster tails drenched in citrus butter. Another no-fuss meal to make, the recipe calls for four frozen rock lobster tails (to cut the cost in half, only buy two), about six to eight ounces each, then butterflied. Broil the tails about eight inches from the flame for approximately 15 minutes. While they're cooking, prepare the sauce with butter, fresh lemon juice, grated orange peel, salt, ground ginger, and paprika. Serve with lemon wedges and a couple side dishes. I'd recommend wild rice and honey-glazed baby carrots for this dish. It's easy to throw pasta and sauce together (which is always romantic thanks to "Lady and the Tramp"), but you can add a lot of flair for Valentine's Day. This recipe for pasta puttanesca includes lots of delicious ingredients for serious flavor, like carrots, olives, dried oregano and thyme, sun-dried tomatoes, anchovies, and fennel. (I love the taste of fennel — it adds that little something that makes you go hmm.) Don't forget the grated Parmesan cheese to top it all off. It's true love on a plate. If you're short on time on Valentine's Day (hopefully because you're buying the roses so you can cover the bed in petals) try this recipe for steak with brandy and mustard sauce that takes less than 30 minutes to prepare. The cut of steak is up to you — you can find affordable loin steak (a big cut so you can halve it at home) — and the sauce is made in a snap with common ingredients. Choose sides that don't take too long to make, like roasted tomatoes or steamed carrots. Pork chops are one of the cheapest meats you can buy, so this recipe for pork with dried apples and prosciutto is cost-friendly from the start. You can buy dried apples at the store and save the leftovers for later (so you have a healthy snack at your fingertips). As for the prosciutto, if you find it too expensive, which it can be, swap it out for bacon; nobody but you will know the difference. For couples that are eating healthy, this recipe for marmalade chicken is not only waist-conscious but wallet-conscious, too. With simple ingredients like chicken tenders, EVOO, orange marmalade, and orange zest, you'll serve up a tangy, citrusy meal that can be paired with accompaniments like broccoli rabe and mashed potatoes. Instant potatoes are just fine; jazz 'em up with garlic butter. I have a trick for that. Know those tiny garlic-butter tubs you get with your pizza sometimes? I save those and use them to flavor mashed potatoes, especially instant varieties. Not every couple is into spending an hour in the kitchen making dinner. So this idea for heart-shaped sandwiches might be perfect for those laidback lovers who prefer plain ol' ham and cheese to roasted pork loin and brie. Make whatever kind of sandwich you like then use a heart-shaped cookie cutter to cut the sandwiches into festive shapes. If you're making a thick sandwich, you can cut the heart shape with a knife. Throw a side of chips on the plate, crack open a couple Cokes, and enjoy the Valentine's dinner that you really want. If you're a light eater like my husband (he never finishes an entire meal because he picks throughout the day), this recipe for avocado and strawberries with a honey vinaigrette may be right up your alley. It's so simple, too. All you have to do is cut the avocado into wedges, slice the strawberries, prepare the dressing and season with salt and pepper. This also could work as a great Valentine's Day lunch at home. Hey, vegetarians and vegans, I haven't forgotten you. This recipe for vegan lasagna comes courtesy of my good friend Brooke McLay (whose family I'm jealous of because they eat so well) and her blog Cheeky Kitchen. It's super cheap, too, with most of the ingredients already in your cabinet. You may have to run out for the bread (should be day-old), eggplant, crushed tomatoes, and spinach, but everything else should be on hand. Since this makes a lot of lasagna, perhaps this is the ideal for a couples' Valentine's dinner. If you want to skip the usual steak and potatoes route, try this recipe for sautéed Portobello mushrooms. 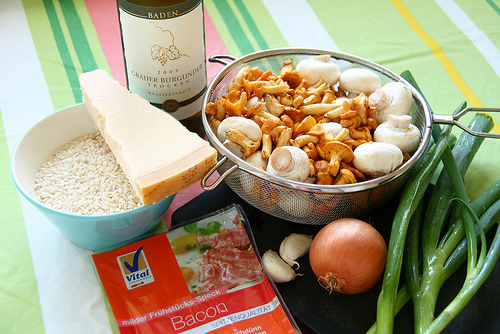 Slice the mushrooms and sautée them with onions in olive oil. Add salt and pepper to taste and top with grated Parmesan and Asiago cheeses. This super-healthy meal would go great with a salad full of greens and other veggies. The Chinese-food lover in your life will be impressed with this homemade recipe for beef and broccoli lo mein. You can use stew meat in place of a higher priced beef so long as you let it tenderize, and you may have to pick up oyster sauce and fresh ginger, but you can probably get away with that one using the ground version in your pantry. It's a whole meal in one dish that automatically seems special. You didn't think I would forget about dessert, did you? This is one of my all-time favorite dessert recipes. From Giada De Laurentiis, this recipe cuts the work in half because it calls for a boxed cake mix souped up with extra ingredients like almond and vanilla extracts. The cupcakes are tasty by themselves, of course, but it's the homemade whipped cream filling folded with fresh, crushed raspberries that make this dessert to die for. Trust me. Have a Valentine's recipe that you'd love to share? Let me know in the comments below. A lot of really cute ideas, I'm not ashamed to say I love all the heart-shaped food. And I was excited to see a recipe from Cheeky Kitchen - I love that blog! These are great! I'm totally adding them to the list I'm working on over at Economically Humble. You're missing out - zucchini on pizza (or in a calzone), esp. if its been sauteed quickly with garlic and olive oil, is freaking delicious! Eating at home is a lot cheaper and definitely more romantic than waiting in a crowded, loud, and dark restaurant for a pricy meal that will probably be rushed so the restaurant can bring in more business. The raspberry cream cupcakes and the risotto with wild mushrooms and scallops sound incredible, I'll have to try cooking those this Valentine's Day! 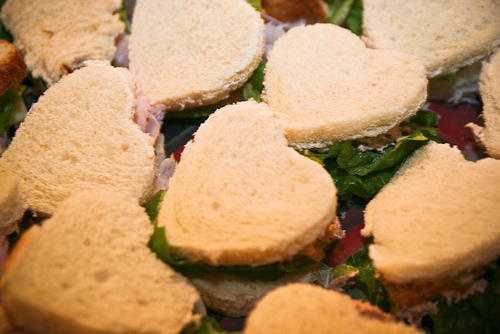 I love the heart shaped sandwich idea! I am horrible at keeping surprises a secret so I kept asking my boyfriend to guess what I got him for Christmas. He always replied with some smart comment like, "A turkey sandwich?" In reality I had bought him tickets to go to a Patriots game in Miami (He is from Boston and we live in Tampa) and I was going to give him the tickets a week or so before the game. I had planned to make him a turkey sandwich and lay the tickets on the plate similar to how a pickle would come served with a sandwich but of course I couldn't keep the surprise a secret that long and he knew two months ahead of time we were going. Long story short, I owe him that turkey sandwich and I am going to use the heart shaped idea this Thursday. I think its so much more fun to cook dinner with the one you love then spend a ton of money on an expensive restaurant. This way you can cuddle up waiting for the food to cook, and enjoy some soft music and candle light. What could be better?